Steven Job Died, and for a (not so short) while, it seemed like everyone had something to say about the matter. Naturally I wanted to say something about it too, and this blog seemed like the perfect platform to say it. But then I heard that there was this 600 page authorized biography, so naturally, I had to read it. First, I think it's important to state how you read a book (especially if it's an Ebook), so I read this one on the Kindle software. That would be both on my Iphone kindle, and on Kindle for the cloud, which is the only version that works on my Linux PC. I bet some of the readers can infer my opinions about Steven Jobs and the book from these facts alone. Anyway, I thought it was a really interesting book. As an aspiring writer, there is enough stuff in there to write something like thirty novels. Just as an example, there is a story there about a Xerox employee who insisted on NOT telling Jobs about all the worderful ideas they had in the late 1970s. I bet her life story is novel worthy, and really, there is just so MUCH in this book. Another good thing about the book is how it tidied everything I knew about Steven Jobs. 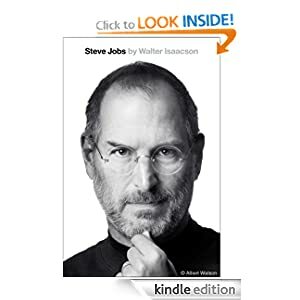 I mean the guy was a feature in my life since at least 1983, when one of my friends got an Apple II clone, but the book really explained how eveything worked from his side (Apple I, Apple ][, LISA, Mac, NeXT etc.) now I think I really know this guy's life story. Also, I think Walter Isaacson (the writer of the book) really got a rounded view of Jobs, by talking to people like Bill gates, and Eric Schmidt and Steven Wozniak. I'm sure some day when someone sits down to write a biography of say Schmidt, this will be really useful, but even now, we get a picture of silicon valley that goes way beyond Jobs. So isn't there anything negative I can say about his book? I think its down side is actually the down side of almost any biography. We get a clear picture of Jobs, but not of the effects of the things that he did downstream (such as apple II clones we had in Israel in the early 1980s, I'm sure he was not a fan!). But even this minor gripe is a good thing. It lets me get in and give you my two cents!